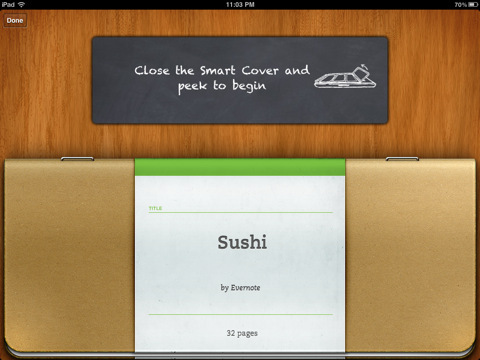 Evernote Peek is a fun little iPad app that you can use with your iPad’s Smart Cover to improve your smarts. If you’ve got an iPad and a magnetic Smart Cover from Apple (or other suppliers at this point) don’t miss out on Evernote Peek. To start, you’ll need to close the Smart Cover. You place the cover on the iPad and as you peel off the first flap, you’ll peek inside the app and read a clue or question. Then you’ll peel off the second fold and peek at the answer in the app. Peel off the Smart Cover all the way to see where you are along the full quiz or exam. The app and cover combined then serve as an awesome new digital flash card for your iPad. Once you download the free app it comes with only a single tutorial and Sushi quiz to get you started. I mean how many times have you tried to memorize Japanese translations of Sushi terms? But don’t worry, that’s not all. 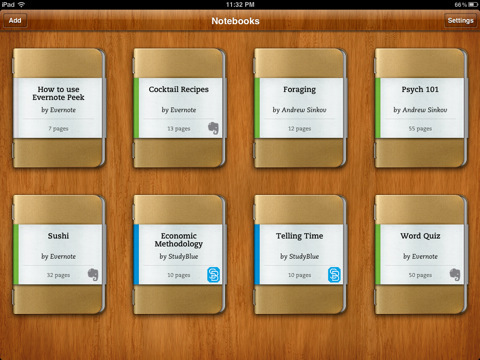 Just log into your Evernote acccount (or create one, it’s free) and you’ll get access to 12 more books to use. You’ll get fun little lessons like Econ 101, Music Terms, Cocktail Recipes, Periodic Table quiz, World Capitals, and State nicknames. What’s more is you can use your very own Evernotes to create peek quizes. Just connect your Evernote account, and pick an existing notebook or make a new one to use with Peek. The clue is pulled from the note title, and the body of the name is set as the answer. A great way to go over and memorize your own notes. So the only downside to this app is that it works only if you have an iPad 2 & the Smart Cover. Other than that, its a no brainer app to have. Great for anyone who wants to use the iPad 2 in a productive way, and it can also be a great app to use in schools for educational purposes. AppSafari review of Evernote Peek was written by Joe Seifi on June 17th, 2011 and categorized under App Store, Education, Free, iPad apps, Productivity. Page viewed 6028 times, 1 so far today. Need help on using these apps? Please read the Help Page. The app has. Now been updated so that you can use it on the iPad 1 or iPad 2 without a smart cover. They have virtual smart covers in the app.